Used in dips, sauces, spreads, relishes and dressings, horseradish has a notable pungent flavor that quickly clears the sinuses. Although generally grown for its root, the young, tender leaves of this plant are delicious in a salad. How much more do you know about horseradish? 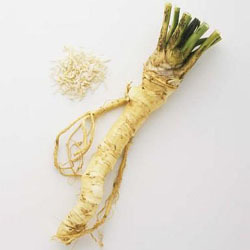 Horseradish (Armoracia rusticana) is a perennial related to wasabi, mustard and cabbage. Believed native to southeastern Europe and western Asia, it is now a popular plant around the world. It has been cultivated for millennia, from the ancient Egyptians and Greeks to modern horticulturalists. In addition to its popular food uses, enzymes found in horseradish are useful in biochemistry applications. The root has even had a variety of medicinal uses, both as an ingested medicine as well as part of poultices and washes. 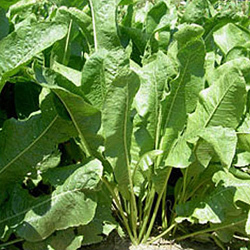 Horseradish has been used to treat urinary tract infections, coughs, arthritis, gout, swollen joints and more. If you are interested in growing horseradish, it is best to know this plant’s needs to encourage the best possible plants with rich, flavorful roots. Plant roots of this hardy perennial in early spring in full sun in a well-turned garden bed or container. One or two roots are more than enough to start with, as this plant self-propagates readily from side root shoots. Water plants as necessary to keep soil from drying out. Horseradish planted this spring will be ready to harvest in October or November but roots may be harvested, as needed, any time of the year. Harvest large roots leaving smaller ones in the soil to fully develop. Dug roots can be stored in the refrigerator for several months. For basic horseradish, scrub and peel the root, chop into small pieces and grind in a food processor adding a small amount of white vinegar and salt. Place in clean jars, seal and refrigerate for up to six months. Other spices may be added if desired for different flavors. With so many tasty ways to use horseradish, you’ll wish you’d added it to your garden years ago!